Modern technology has all but eliminated the need to memorize phone numbers. With contact apps that can store millions of contacts and powerful dialer apps that can instantly look up numbers What Is the Best Contacts & Dialer App for Android? What Is the Best Contacts & Dialer App for Android? You don't have to settle for your phone's built-in contacts and dialer apps. Read More , you probably only know a handful by heart. No matter how few numbers reside in your head, hopefully you know your own phone number! However, there may be times when you need to look up the number of the phone you’re using. 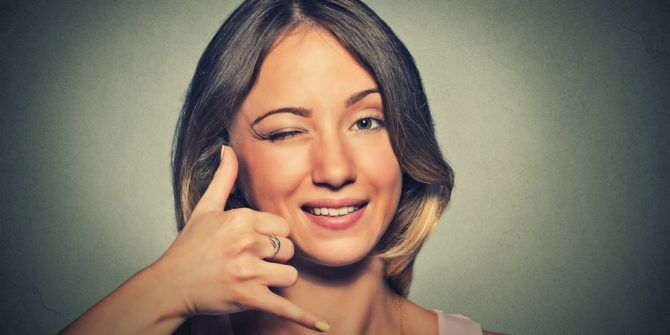 Perhaps you had a brief bout of amnesia or are trying to return a lost phone How to Return a Lost Phone in Four Easy Steps How to Return a Lost Phone in Four Easy Steps Every year, millions drop their mobile into the unknown. In the US, about 50% of lost devices are returned to their owners. The rest get resold or reused – while thievery may seem eco-friendly and... Read More . Whatever the circumstance, here’s how to look up your own number on Android or iOS. On iOS, you can quickly see your number in two ways. Open up the Phone app, then tab the Contacts tab at the bottom of the screen and your number appears right at the top. For another method, head to Settings > Phone and look for My Number. On Android, the process varies a bit thanks to hardware manufacturer differences Android Skins Explained: How Do Hardware Makers Change Stock Android? Android Skins Explained: How Do Hardware Makers Change Stock Android? Hardware makers like to take Android and morph it into something that is entirely their own, but is this a good or a bad thing? Take a look and compare these different Android skins. Read More . Try tapping the Contacts app and look for the Me entry at the top of the list. You won’t find this on every phone, so you can utilize the secondary method. Browse to Settings > About phone/device > Status. You might see the number listed here. If not, tap the SIM status entry to open another menu. Scroll down a bit here and you should see My phone number. Now you can easily find the number of any Android or iOS phone if you ever forget them! Have you ever had to search for the phone number on a device like this? Let us know if you knew about these methods in the comments! I tried this method, but it says Phone Number Unknown.